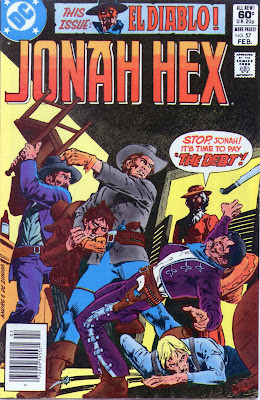 Matching Dragoons: Jonah Hex #57 "The Debt"
Jonah Hex #57 "The Debt"
First off, welcome Ross! It's good to see ya. I always enjoyed your work. It's night and Jonah is hitching his horse outside a saloon and we hear from inside a ruckus starting up that sounds like a woman is getting smacked around. Jonah walks in and orders a whiskey. There is a silver-haired woman on the floor with four thugs standing around her calling her a tramp. Jonah tells the bartender to leave the bottle, politely lifts the hat off the head of thug #1 and smashes the whiskey bottle on his skull. 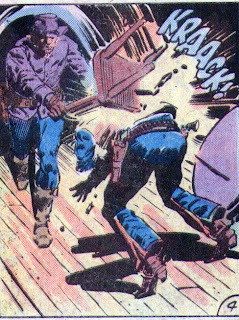 Thug #2 starts to pull a pistol, but Jonah gives him a blow to the gut and then the jaw. Thug #3 jumps Jonah from behind, but Hex, using leverage, lifts the man and tosses him over the bar into the mirror. Thug #4 pulls a knife and tries to stab Jonah. Hex side-steps, grabs the man's arm and breaks it for him. Then, as a reminder not to mess with a Hex, Jonah busts an oak chair over his skull. Jonah then walks over to the woman, helps her off the floor and says "Them hardcases didn't hurt yuh none, did they, ma?" The woman is Ginny Hex! She comments that she hardly recognized Jonah under all that... but Jonah cuts her off, saying he came as soon as he got her letter. The barkeep demands payment for the mirror and Jonah forks over $500 (little over $9000 today). Jonah lets his mom ride his horse and he walks alongside through the town. She says that she knows she has no right contacting Jonah after over 25 years, but she is in trouble and owes $2,000 ($36,000) because she borrowed some money from Dirk Jagsted, a local gambler. Jonah asks what happened to the money and Ginny stammers that she spent it on a man who ran out on her. They head for the stable and bed the horse for the night and Ginny leads Jonah to her room in the back of the stable. Ginny offers Jonah the bed (a mattress on the floor) but he declines, saying that in the morning he'll decide how to handle Jagsted. However, he lies awake, thinking back 27 years, to the June 1848. He had just turned 10 and had gotten into a fight with several boys who had been calling his mom a tramp. Young Jonah gave it his best shot, but the four boys took turns holding him and beating him senseless. As they leave Jonah bleeding in the grass, they remind him one more time that his mom is a tramp. Much later, Jonah hobbles home where his mom is surprised to find him bloodied. Woodson, however, makes no bones about not coddling Jonah. He says that he has a moonshine run to make and that he'll be back home around noon tomorrow. Much later, there is a knock at the door and Jonah answers it. At the door is a traveling salesman name Preston W. Dazzleby. The salesman is a dry goods merchant that is wanting to show some of his wares. He pulls out a dress and shows it to Ginny. Ginny, never taking her eyes off Preston, tells Jonah that it is time for bed, while she samples what Preston has in his case (if'n ya know what I mean. wink wink nudge nudge). Jonah heads off to bed, laying there, reliving the terrible things that the other kids said, thinking about terrible ways to get his revenge... eventually he hears some laughter and gets out of bed to investigate. Walking down a short hallway, Jonah finds the door ajar and peeks through. Jonah sees Dazzleby getting dressed and his mother packing a suitcase. Jonah steps into the room with a simple "Ma?". Ginny kneels down and explains that she is leaving because Woodson beats her when he gets drunk. She and Preston are heading for St. Louis and when they get settled, they'll send back for him. Ginny & Preston load up the wagon and ride off into the night, leaving a ten year old Jonah standing in the dark, abandoned in his house. 27 years later, Jonah is roused from his remembrances by shouting outside the stable. Turns out it's Jagsted wanting his money. Jonah gets dressed and walks out of the room into the stable, facing Jagsted and his three men. Jagsted states that he has no idea who Hex is but he wants his money from that 'broken-down tramp' and on the count of three, he'll blow Jonah's head off. How far does he get? Guess. and we don't see Ginny ever again. Timeline - 1875. Scientists have determined that 1875 was a celestial anomaly and actually had 3279 days instead of the standard 365. Scientists refer to this as a Running-Broad-Jump Year. This story covers just one evening in 1875 and one day in 1848. This takes place a year prior Jonah's first run-in with the law and just a few months prior to his first fight. We have more than one reference to Jonah 'just' turning 10 in early '48 so I'm resigned that Jonah's birthday is NOT in November. We have only seen Jonah's mom once before and that was not the best family experience. This is a pretty painful story to read, even though I have not experienced any abandonment issues in my family. Ginny is constantly referred to as a 'tramp' and I'm not sure if Fleisher meant that she was just kinda 'loose' or if she was an actual prostitute. Either way, she is a very sad woman with a very sad life. 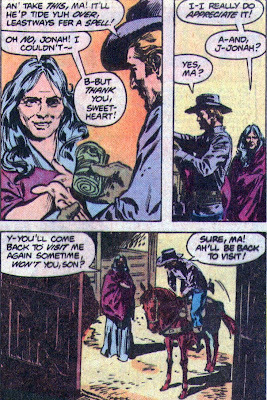 Not having seeing her son for 27 years and when he shows up, he's horribly disfigured and ends up walking out of your life, must have been very painful, but it DID seem that all she was concerned about was the money. No mention of Mei Ling, so this one could have been in the chute, waiting for a scheduling delay. Like all of the stories recently, this was shortened due a backup El Diablo feature. Next Issue - A lost Treasure and a trick dog. Man, Jonah had a crappy childhood. 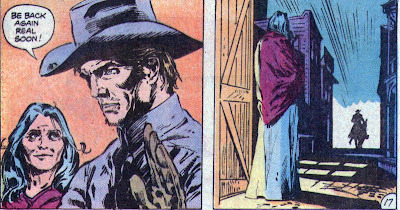 You don't usually see much pathos in a Jonah Hex book, but this one did the trick. I just realized that the bad guy was gonna say Three and only got out "Th" before Jonah finished it with "THUK" of the knife. Am I the only one that thinks that older Ginny looks like crazy Margo Kidder?